With its vibrant red and pink blooms, this gorgeous mix of flowers will attract wildlife and humans alike! 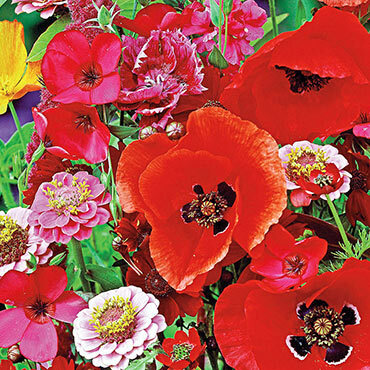 These colorful annuals entice butterflies and hummingbirds to flock to your garden all summer long. Simply plant in well-drained soil in full sunlight after the last frost of winter for the biggest, most vibrant blooms. You'll find Scarlet Flax, California Poppy, Catchfly, Baby's Breath, and Shirley Poppy among other annuals in this beautiful mix. They'll grow between 8-36" tall for a true wildflower appearance. Cut a bundle of them and place in a vase for a beautiful, colorful bouquet! Approximately 300 seeds per packet. Botanical Name: Scarlet Flax, California Poppy, Catchfly, Baby's Breath, and Shirley Poppy among other annuals. Height: 8 - 36 inches. Spacing: 1 inch apart, in rows 12 - 24 inches apart. Spread: 8 - 36 inches. Color: Mix of reds and pinks. Depth: 1/4 - 1/2 inch deep. Germination: 10 - 28 days. Pruning: Dead-head to promote additional blooms. Seed Count: Approximately 300 seeds per packet.